We use two companies for SSL certificates, SSLs.com and StartSSL. The certificates from StartSSL are free, but the web site is complicated to use. Create a domain folder within the ssl-cert folder e.g. Site - Configuration. Run the following commands in that folder. When using ssls.com the Common Name must include the www i.e. www.hatherleigh.info rather than hatherleigh.info. Do not enter the email address, challenge password or optional company name). Just press Enter to ignore. This process will generate two files, server.csr (the certificate request) and server.key (the private key). When the certificate is approved, you will be sent an email containing a couple of certificates. Copy the Web Server CERTIFICATE into a file called ssl.crt. The certificate is the text starting with -----BEGIN CERTIFICATE----- and ending with -----END CERTIFICATE-----. Copy the INTERMEDIATE CA into a file called intermediate.crt. The certificate is the text starting with -----BEGIN CERTIFICATE----- and ending with -----END CERTIFICATE-----. Instructions for http://www.ssls.com/ are similar. See the section above for instructions on generating a certificate request. 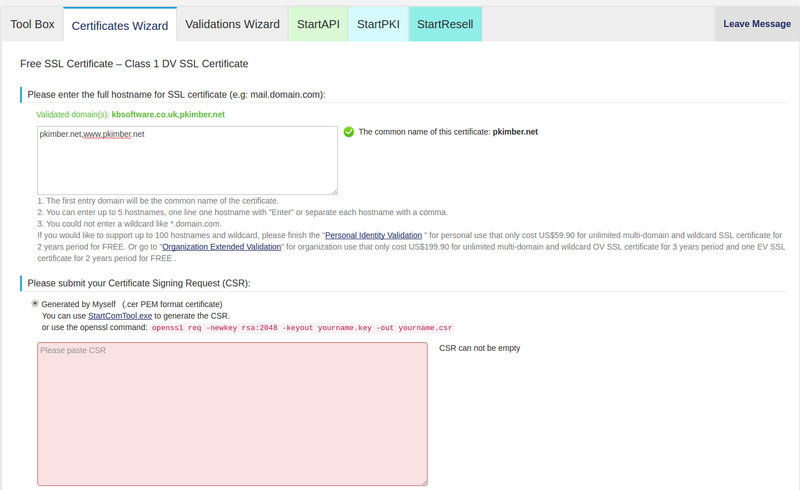 Using https://www.startssl.com/, enter the Validations Wizard and choose Domain Validation, enter the Domain Name, select a Verification Email and then enter the verification code sent to the selected email address. Enter the Certificates Wizard, select Web Server SSL/TLS Certificate, then click Continue. Paste the contents of server.csr into the bottom box. The request is the whole file starting with -----BEGIN CERTIFICATE REQUEST----- and ending with -----END CERTIFICATE REQUEST-----. Click Submit, then Certificate List, then click Retrieve for the appropriate common name (example.net). Extract NginxServer.zip from the downloaded file into the ssl-cert folder. This was an issue with the line breaks in the concatenated files. To acheieve this we added a blank line to the ssl.crt file, re-concatenated, used fab domain:www.hatherleigh.info ssl to place the new file on the server and then re-started nginx with service nginx restart on the server as root. For further help solving this issue, see Fixing PEM routines:PEM_read_bio:bad end line error.